This is a Client Access License (CAL) under SQL Server 2014's Server/Client licensing model (Available for Standard and Business Intelligence Editions only; Core-based licensing is offered separately, for Standard and Enterprise Editions only). CALs are available as per-user or per-device licenses (please see the product name to determine whether this is a user or device CAL). This license may be used with Standard or Business Intelligence Editions of SQL Server 2014. 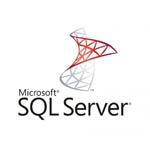 A SQL Server Device CAL is required in order for a device (for example, a PC, workstation, terminal, PDA, mobile phone, and so on) to access or use the services or functionality of Microsoft SQL Server. The Server plus device CAL model will likely be the more cost-effective choice if there are multiple users per device (for example, in a call center. A SQL Server User CAL is required in order for a user (employee, customer, partner, and so on) to access or use the services or functionality of Microsoft SQL Server. The Server plus user CAL model will likely be more cost effective if there are multiple devices per user (for example, a user who has a desktop PC, laptop, PDA, and so forth). -This licensing model can be used anytime the number of users can be readily counted (e.g., internal database applications). -To access a licensed SQL Server in the server + CAL model, each user must have a SQL Server CAL that is the same version or newer (for example, to access a SQL Server 2012 server, a user would need a SQL Server 2012 or 2014 CAL). -Each SQL Server 2014 CAL can provide access to multiple licensed SQL Servers, including SQL Server 2014 Business Intelligence Server as well as prior versions of the Enterprise Servers. -All existing licenses of the Enterprise Edition in the Server + CAL licensing model with Software Assurance (SA) can be upgraded to SQL Server 2014, and SA can be maintained to provide access to future software updates. These licenses will continue under the Server + CAL licensing model. -Existing Enterprise Edition licenses in the Server + CAL licensing model that are upgraded to SQL Server 2014 and beyond will be limited to server deployments with 20 cores or less (20 hardware threads in virtual environments). This 20 core limit only applies to SQL Server 2014 Enterprise Edition Server licenses in the Server + CAL model and will still require the appropriate number/versions of SQL Server CALs for access. Software Assurance (SA) is an offering available with Microsoft Volume Licensing programs that helps you get the most from your software. Software Assurance is a comprehensive maintenance program that can help you gain control of your technology strategy, improve IT staff skills, decrease support spending, and effectively plan for new software deployments. With Software Assurance, you can access training and deployment resources that enable employees to work more efficiently than ever. You also acquire tomorrow's technology at today's prices and have the ability to spread payments annually instead of upfront (or in two-year payments for the MOB and MOV programs). 2. Home use rights for MS Office applications covered under SA. 5. Cold Server Backups - For each server license for which a customer has active Software Assurance, the customer has the right to install the same software on a "cold" backup server for use in disaster recovery. Other tools include Corporate Error Reporting (CEP) to help you analyze problems and distribute fixes, Enterprise Source Licensing (1,500 desktops or more) that lets you access Microsoft Windows source code for internal development and support, and the Windows Preinstallation Environment (Windows PE) for speeding up and automating deployment.